Florida has some of the most volatile housing markets in the country. The Sunshine State was one of the worst affected during the subprime mortgage loan crisis, with mortgage delinquency rates hitting 20% in 2009. But in recent times the state has seen explosive home value growth. Median home values in the state jumped 10% from 2014 to 2015. With home values growing so fast, there are rising Florida housing markets worth checking out. Compare current mortgage rates in Florida. In order to find the fastest-rising housing markets in Florida, we looked at city data for population growth, housing stock growth, median home value growth and median income growth. To understand where we got our data and how we put it together, see our data and methodology section at the end of this article. Three-way tie – Three Florida cities share the honor for hottest Florida housing markets: Lehigh Acres, Kendall and Fort Myers. Tough to go wrong in Florida – Only one city in our study (Lakeland) saw its median home values decline from 2011 to 2015. Many cities actually saw double-digit home value growth. Plus, average Florida mortgage rates are below 4%, so there are plenty of good deals on mortgages out there. Signs of a new bubble? – From 2005 to 2007, right before the housing market collapsed, median home values in Florida grew 21% from $189,500 to $230,400, according to U.S. Census Bureau data. The next year, in 2008, the median home value in Florida dropped 5%. From 2011 to 2015, the median home value in Florida grew 19.1% from $151,000 to $179,800, eerily similar to the rise from 2005-2007. The past 10 years have been a roller coaster ride for homeowners in Lehigh Acres. In 2006, median home values in the area were $236,700. Thanks to the housing crisis and the ensuing recession, that number dropped all the way to $69,900 by 2011. Since 2011, things have picked back up. From 2011 to 2015, home values here rose 68% from the aforementioned $69,900 to $117,500. For those readers worried about inflated numbers there are signs that demand for housing here is growing, meaning the values are less speculative than in the past. The number of people living in Lehigh Acres has grown from 98,100 in 2011 to 119,480 in 2015. That’s an increase of 21.8%. During the same time, the number of housing units dropped. 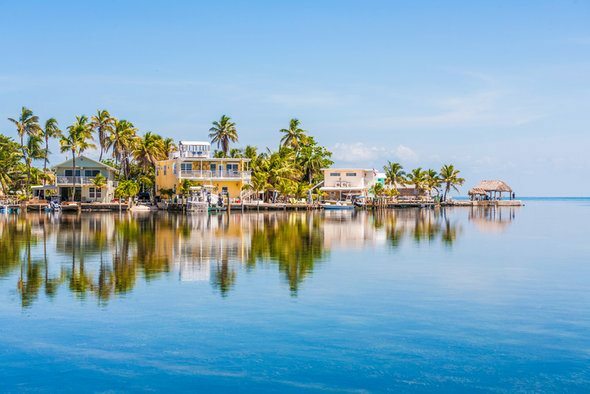 Kendall, not to be confused with Kendall Green or Kendall West, is located just outside of Miami and is one of three cities tied for the fastest-rising housing market in Florida. Median home values in Kendall have almost reached their pre-Recession peak. In 2015, the median home value in the area was $387,500 while in 2007 it was $398,200. From 2011 to 2015 median home values in the area rose 36.1%. While that may sound like a lot, the change is probably affordable to many Kendall residents. Over the same time period, Kendall residents saw their median individual incomes rise by 26.6%. 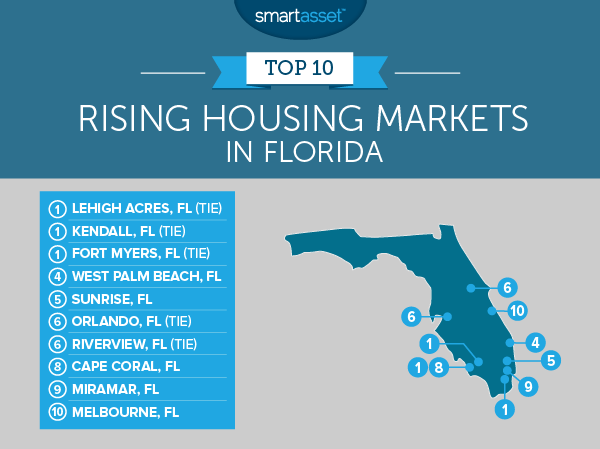 Tied with Lehigh Acres and Kendall for the fastest-rising Florida housing market is Fort Myers. Perhaps best known as the spring training base for many Major League Baseball teams, Fort Myers was also a 2016 boomtown. From 2011 to 2015, the population growth outpaced new housing stock growth by 10.8%. The median home values grew 57% over that same time period. No city in the top 10 saw a bigger decline in housing stock than West Palm Beach. From 2011 to 2015 its housing stock shrunk 4.6%, from 54,482 housing units to 51,976 units. When you combine that with the increase in population (the West Palm Beach population grew 5.7% from 2011 to 2015), you can see there was a pretty steep uptick in demand for housing. Over that same period West Palm Beach residents saw their incomes increase by 16%, meaning they have more income which they can put toward housing. Located about 30 miles from Miami is Sunrise, our fifth-fastest rising Florida housing market. Only one city in our top 10 saw faster income growth than Sunrise. That’s a good sign for people interested in homes in the area. This city has also seen noteworthy population growth. From 2011 to 2015, the city experienced a population boom of 7.8%. That increase outpaced the rate of new homes by 1.9%. Even more impressive than those two stats is the change in home values. From 2011 to 2015 median home values in Sunrise grew 37%. Orlando is the biggest city in our top 10. Despite being so large, it still saw impressive population growth. From 2011 to 2015 the population in Orlando grew 11.4%, the third-fastest growth in the top 10. During the same time, there was a bit of a housing boom in Orlando. The number of housing units jumped 8.2%. This leaves a difference of 3.2%, meaning more people are chasing fewer housing units. That increases the likelihood that home values will rise. Orlando’s best score came in income growth. Thanks in part to the growing tech industry and the tourism industry, incomes in The City Beautiful grew 16%. No city in our top 10 is faced with a bigger housing crunch than Riverview. New people in the area outgrew new homes by a whopping 32.4% from 2011 to 2015. This increased demand for housing led to homes growing in value by an average of 22% over the same time period. Median home values in Cape Coral shot up in the recent past. In 2011, the average home in the area was worth around $121,900. By 2015 that number rose 55% (the fourth-highest increase in the study) to $189,900. Let’s say you purchased a Cape Coral home in 2011 for the median home value and then sold it in 2015 for that year’s median value. You would have netted a cool $68,000. What is causing Cape Coral home values to rise so fast? It comes from both a lack of supply (population numbers outgrew housing stock by 7.6%) and new demand – Cape Coral residents saw incomes grow 7.3% from 2011 to 2015. If you bought a home in Miramar in 2011, you are probably patting yourself on the back right now – as long as you didn’t sell it. From 2011 to 2015, median home values in the area grew an astonishing 61%. What can explain such growth? Well, the population outgrew new homes by 8.4%, the fifth-highest rate in the top 10, increasing the demand for housing. The median incomes in Miramar grew 4.7% over that same time period. From 2011 to 2015, the housing stock in Melbourne decreased by 11.8%. Over that same time period the population grew 5.3%, for a net difference of 17.1%. That means plenty of demand for housing. The area has not seen the most impressive home value growth – only 18.8% from 2011 to 2015 – but thanks to the demand for housing, we expect that number to rise. Residents of Melbourne should also be able to afford slightly more expensive homes, as well. They saw their incomes rise almost 12% on average from 2011 to 2015. Change in median incomes. This is the percent change in median individual incomes from 2011 to 2015. Data comes from the Census Bureau’s 2011 and 2015 1-Year American Community Survey. Change in median home values. This is the percent change in the median home values from 2011 to 2015. Data comes from the Census Bureau’s 2011 and 2015 1-Year American Community Survey. Difference between population change and housing unit change. This is the percentage point difference between the percent change in population and the percent change in housing units from 2011 to 2015. Data comes from the Census Bureau’s 2011 and 2015 1-Year American Community Survey. We ranked each city across each metric, giving all metrics equal weighting. Then, we found the average ranking for each city. After that, we assigned a score to each city based on its average ranking. The city with the highest average ranking received a 100, while the city with the lowest average ranking received a 0.